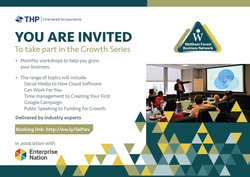 The Waltham Forest Business Network has partnered with East London and Essex's leading firm of accountants THP Chartered Accountants to bring you the Growth Series - a series of practical workshops to help you grow your business. Workshops will be held at THP's offices in Wanstead, East London, just a few minutes from the Central Line. The Growth Series is delivered by industry experts with current experience and will provide you with the information you need to help you to develop and growth your business.